The original illustrations were done in ink and watercolor and scanned into computer for final touch up and addition of text. 24 page picture book. 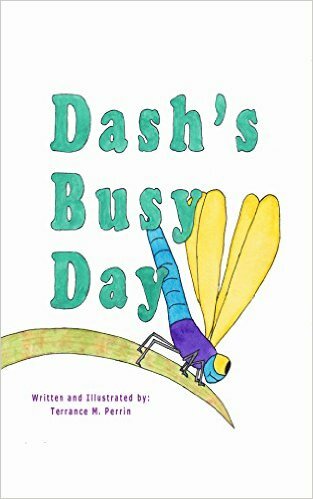 Dash's Busy Day is such a lovely book to share with your child. It is beautifully illustrated by the author and has the added benefit of being educational in so many different ways. The most obvious of course are counting and learning directions but the scope for learning from this book is so much broader. I read this story to a class of 5 year olds and they really loved it. They didn't complain that the creatures didn't look right (as they have done with similar books) and they enjoyed the counting from one to ten (even though they can count to 100, or so they informed me) and the more able children felt proud of themselves in being able to read out loud along with me. The language in the story was pitched just right for younger children and I liked that the numbers were written in both digits and words. We also used the book as a starting point for learning about dragonflies. We looked at photos on the internet of Ireland's dragonflies and we discovered a little bit more about them. Older children and their teacher could also enjoy this book as a stimulus for drawing simple plans or art lessons based on 'a bird's eye view.' The author has made some lovely, simple 'bird's eye view' pictures which provide a useful tool in explaining the concept.